THE BASKETBALL WORLD is talking about the possibility that LeBron James could return to the Cleveland Cavaliers when he becomes a free agent this summer. We think it’s highly unlikely for a bunch of reasons, which we’ll get to below. But speculation’s fun, so here’s one plausible “LeBron Returns” scenario that people like SI’s Phil Taylor are talking about. The Cavaliers trade the No. 1 pick in the loaded 2014 NBA Draft, and some combination of Anthony Bennett/Dion Waiters/Tristan Thompson/Anderson Varejao to Minnesota for Kevin Love. The Cavaliers let Spencer Hawes and Luol Deng leave in free agency, creating enough cap space for a max-contract free agent. LeBron opts out of his contract and signs with the Cavaliers. With Love looking like he’ll leave in free agency in 2015 anyway, this scenario is at least plausible. A core of LeBron/Love/Kyrie Irving has a better chance of winning multiple championships between 2014 and 2019 than LeBron/Wade/Bosh. This sounds all well and good. Here’s why it won’t happen. LeBron would have to take about $30 million less to sign with the Cavaliers. James can sign a five-year, $115.3-million contract with Miami. He can only sign a four-year, $85.6-million contract with Cleveland. Kevin Love will still become a free agent after 2014-15, so Cleveland might be reluctant to give up a lot in a trade. It’d be the same gamble the Lakers took on Dwight Howard in 2012. Would the Cavs give up a ton of assets for Love even though he could walk for nothing after this season? The Cavaliers already botched the LeBron years. Cleveland’s recent history of drafting and signing free agents is awful. Why would LeBron ever work for Dan Gilbert again? Ever? Remember that comic sans letter? 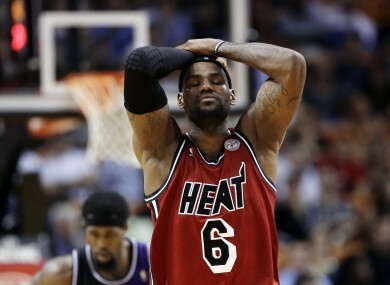 Sure, the Heat look like they’re at a crossroads right now. Wade has looked old at times in these playoffs, and the veterans around the Big 3 (Ray Allen, Shane Battier) have looked even older. But why would LeBron think the Cavs have a better chance of rebuilding a team than Pat Riley? Email “Here's the dream scenario where LeBron James goes back to Cleveland this summer”. Feedback on “Here's the dream scenario where LeBron James goes back to Cleveland this summer”.